Scarlet Macaws, Ara macao, are beautiful members of the large macaw family. They are a gorgeous scarlet red color with a band of yellow on the mid wing, and a band of blue on the end of the wing. They do have facial stripes like many of the other large macaws but the extremely fine feathers are an almost clear white or pink, that blends into the facial skin and are very difficult to see. In the wild, scarlet macaws have a large range from Mexico, Central America, Panama, northern Columbia, the Guianas, and much of Brazil. Scarlet Macaws are the longest of all the large macaws at 36-40 inches from head to tail and they typically weigh between 900-1100 grams. There can be a large variation is size depending on what region the bird is from. Scarlets tend to be the most emotionally needy of all of the large macaws. They do not like to be left alone, and prefer to be in the middle of whatever is going on. They are very intelligent, and can be very nosy, wanting to participate in whatever is happening, and can be very manipulative in getting what they want. They need to be given a lot of things to do to keep them occupied. They also thrive on drama, and so can easily be taught tricks by using verbal praise, but also love getting drama for the sake of drama itself. We had one female Scarlet named Mickey that would grab hold of a person’s hand with no pressure just to see if she could get a reaction. If the person did not respond, she would put more and more pressure on the hand until she got the reaction that she wanted (usually a yell of pain!). We learned quickly with her to give her some calm acknowledgement before she would bite hard so as not to reward her for biting. Scarlets have a reputation for being a bit pinchy (they tend not to bite hard, unless provoked, but tend to pinch a tiny amount of skin). This seems to be a way of getting attention when they are being ignored, and a way of testing to see if they can be “top bird.” They go through a pinchy stage at between 12-18 months, and if not taught correctly can continue the behavior, but if properly socialized, become very sweet and loving. 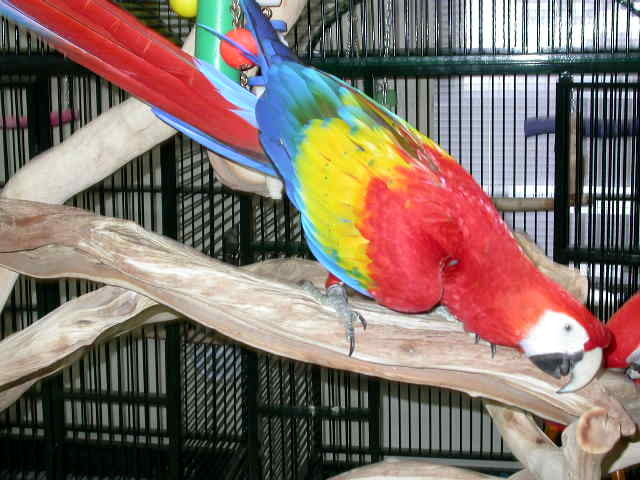 They also are a very flock oriented macaw, and when around other Scarlets tend to form a gang that prefers themselves to people, and then also have more of a tendency to pinch or bite. Multiple Scarlets can be in the same household, but they need to have their own cages and individual attention to keep them from ganging up on their owners. As long as the birds have a lot of individual attention and are allowed to always be in the middle of things they tend to be happy. Scarlets are a very intelligent macaw and can learn to talk a bit, though like the other large macaws tend not to talk especially clearly. They are a beautiful macaw, but can be a bit more difficult to deal with than some of the other species of macaw because they are so emotionally needy and manipulative- they are not usually good for a novice bird owner. A Scarlet will always keep you on your toes, but are very loving and bring much happiness into their homes.